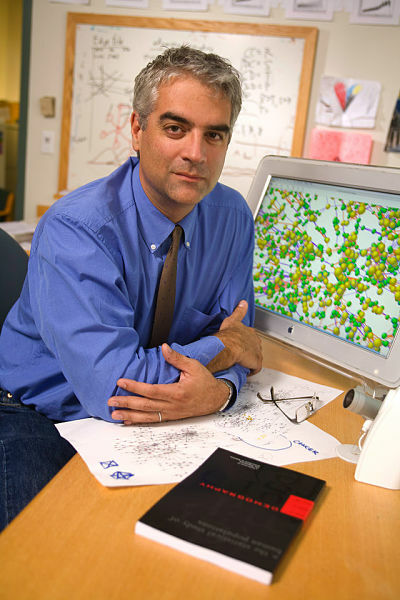 Nicholas A. Christakis, the Sol Goldman Family Professor of Social and Natural Science at Yale University, is a sociologist and physician known for his research on social networks and on the socioeconomic and biosocial determinants of behavior, health, and longevity. He directs the Human Nature Lab, and he is the co-director of the Yale Institute for Network Science. Here, Sierra Williams, the managing editor of the London Scool of Economics’ Impact of Social Sciences blog, interviews Christakis ahead of an LSE panel discussion on October 21 (details below) on “Do We Need to Shake Up the Social Sciences?” He discusses his thoughts on the frontiers in interdisciplinary research, the need for social science departmental re-shuffles, and the radical changes shaping social science’s relevance today. Back in July, your article Let’s Shake Up the Social Sciences created quite a stir. Can you briefly summarize your points? My observations regarding this topic are driven partly by my own dual training in the natural and the social sciences, and it just suddenly dawned on me one day that all of the departments that I had been in as a medical student in the 1980s were gone, at least formally speaking. There were no longer departments of anatomy, physiology, biochemistry, and so forth. And all of these departments had been replaced with new departments with names like systems biology, neurobiology, and molecular biophysics. Meanwhile, the departments that I was familiar with from my social science training, their names still existed. The sociology, economics, psychology, anthropology, and political science departments have the same names they have had for a hundred years. This interview by Sierra Williams originally appeared on the LSE Impact of Social Sciences blog as “Five Minutes with Nicholas A. Christakis: “Discovery is greatly facilitated by methodological innovation” and is reposted under the Creative Commons license (CC BY 3.0). So I began to think about the ways that these institutional arrangements, in the shape of departments, reflected in this nomenclature, may constrain innovation in the social sciences. It seemed that the natural sciences were much better at identifying where the scientific frontier is, and – here is the point – aligning institutional arrangements accordingly. And here I’m not speaking merely about naming departments, but the actual formal organisation of the disciplines – realigning them in a way that moves the fields to where the scientific frontier is. I think this reflects a deeper set of issues. For example, I think that the natural sciences are much more comfortable (and not just more able — because I think the social sciences are roughly equally able) to declare victory and move on. Yet, very often in the social sciences, we don’t do that. We don’t allow ourselves to say, “You know, we have pretty much sorted this topic out.” There are still important topics — just like anatomy is an important topic – people obviously still need to learn anatomy, and we need people that work in, and teach, anatomy — but we really don’t need a lot of research into gross anatomy anymore. We need to identify where the interesting anatomical research is – for example at the sub microscopic level or in terms of the invention of new surgical approaches – and to create institutional arrangements that permit scientists to work in that area and to focus their attention there. Whereas, in the social sciences, we miss that opportunity; we seem to keep returning to well-trod topics, and our disciplinary departmental arrangements reflect that. I also think this arrangement retards our ability to engage with new topics. Now, it’s clear that many social scientists are engaged with some of the examples I’m about to give, so I don’t want to be misunderstood in this regard. I’m not saying no one is working in these areas. But I think, for example, that there is tremendously important social science that can be done with respect to the environment. What is the impact of the environment on human activity? What is the impact of human activity on the environment? Could any of this have an evolutionary basis? What are attitudes toward preservation of the environment, and to what extent is the environment seen as a commons? How do attitudes and behavior with respect to the environment spread in social networks? And so forth. Or another example might be new methodological approaches in the social sciences. There are at least three very radical changes in the social sciences that I think are in the offing that we should embrace. First, a biological hurricane is approaching the social sciences. Discoveries in physiology, neuroscience, and genetics are going to push up against the social sciences, and we social scientists should own some of those developments. We shouldn’t just abrogate our knowledge of the social world to the natural sciences when it comes to this. For example, I think the fields of behavior genetics, evolutionary psychology, and biosocial science are areas that are very important and should get a lot more attention. Of course, I must admit that these interests are parochial for me. Second, we are in the midst of what my colleague James Fowler and I like to call the Massive/Passive Data Revolution. If you had asked social scientists 20 years ago what powers they dreamed of having, they would have loved to have a tiny Black Hawk helicopter that could monitor you passively – who you’re talking to, what you’re buying, what you’re doing and thinking – and if it could record that in real time for millions of people across cities, that would be amazing. And of course that is exactly what we have now with cellular phone technology. We have data that allows a much deeper engagement in the study of social processes. And, to my eye, this type of data will allow us to answer key questions that are very deep and fundamental, such as: What are the origins of collective action? How do groups of people acquire properties not present in individuals? What are the origins of norms and culture? What are the implications of norms and culture on a large scale? Of course, I should also mention that we will need to think about ethical aspects of obtaining and analyzing such data, but this type of problem is not unique to the social sciences. Third, there is a kind of re-discovery of experimentation in the social sciences at the moment. There has always been a tradition of doing experiments, especially in psychology, but, since the 1950s with the rise of modern regression-based statistical methods and survey data collection procedures, most of the analyses have been observational rather than experimental. But increasingly we’re seeing field experiments in hospitals, schools, villages, and online venues, and I think these experiments offer new opportunities to understand how the world works. So these are three methodological things that are shifting along with the more substantive things that are shifting – and should shift – in the social sciences. How might universities come to be more integrated across disciplines to respond to these 21st century problems? Why should departmental names and – more important – fields and structures matter? I think it’s clear that, as social scientists, we know that institutions matter. We need to turn the lens on ourselves to study how our institutional arrangements affect the nature of our work and the impact of that work upon our society. I think there is a way in which young people in their 20s are increasingly interdisciplinary, and are increasingly using the kinds of novel tools I mentioned just now, merging biological and computational approaches to the social sciences, for example. And I see that many of them are frustrated when they go out to look for work and they are seen as too unusual, too far afield. And I can’t tell you how frustrating it is to find people who are interested, for example, in inter-disciplinary areas like neuro-economics or biosocial science or behavior genetics or computational sociology, who are looked at askance by existing institutional arrangements – I think very wrongly. I think there is a way in which our institutions, our journals, our departmental structures, and so forth, affect the nature of science that is done. Part of the problem is that, typically, the appointment of new faculty resides within departments, and this is a very conservative force because we have lifetime tenure. It’s like the United States Senate, moving slowly. So it means that departments can be very slow to evolve or change. But the natural sciences have evolved in terms of their institutional arrangements and their foci of inquiry. So we can certainly learn from them just as they can learn from us. To some this evolution may sound like a political minefield where academics must choose to align themselves to the right department – what do you say to those that fear disciplinary change? What do the natural scientists do? If you look at the career of a natural scientist at the turn of the last century, he might have started his appointment in a department of zoology, but, over the course of his career, been subsequently appointed to the department of histology and that might have evolved to be a department of physiology. So, if the natural scientists can do that, why not us? Over the course of a career, one can move because the field changes. You’ve got your PhD in a field, sure, but why should that define you? Why should the choice a 20-year-old scientist makes regarding what she studies serve as a label, let alone a constraint, for the next 50 years? I’ve had students who studied system biology as their PhD who then worked in mathematical biology and applied economics, and who then got appointed in a department of psychology. Or I’ve had students who have gotten PhDs in computer science but become interested in sociology. Or students with PhDs in sociology who become interested in biology and behavioral genetics. Why should we constrain ourselves as a field? Why should we build institutional arrangements that limit our vision rather than expand it? The whole point of institutions is to help us! More practically, how might academics in these disciplines determine whether their subject has been fully figured out and can be moved on from? Is it a gradual process or is it something more radical? Well I’m not sure. There are many relevant actors with respect to this. There are university administrations, faculty themselves, funders, political entities. But there is change. At LSE, for instance, there are many departments not limited to the five mentioned earlier (sociology, economics, psychology, anthropology, and political science), and I think that these changes are good and desirable. At Yale, we recently established a new social science department in Global Affairs (the Jackson Institute) that can appoint faculty and award degrees. I think that there are ways that everyone can have an impact in helping to move the field to the frontier. I think we can also think about how we select students and how we train them, but we have to couple that with the creation of opportunities for these wonderful students whom we train. It’s a horrible thing to raise a man or a woman to a high height only to let them fall. If you recruit these students and make them excited about science and then they emerge looking for work and cannot find an outlet for their enthusiasm, that’s terrible. Incidentally, I think this is one explanation for the increasing appeal for social scientists to work at firms like Google, Facebook, Zynga, Amazon, and so on. The idea that the highest form of achievement is to become one’s professor doesn’t make much sense to me. I think one of the things economists have done particularly well is to foster and permit a movement of people between academia and the private sector that is terrific. There is nothing wrong with that. If all we do when we mint PhDs is want them to get jobs in academia, and if we think that is the highest form of achievement, we have done a disservice to ourselves and to our students. We have created this crazy pyramid system which is dysfunctional. We need to see our obligation to be to train educated people who might work in any number of ways, many of which are equally useful to society (let alone to themselves). There is currently a split between applied research (which often doesn’t get widespread academic recognition) and more established academic departments – what effect might a restructuring have on this split? Should institutional re-arrangements look to recognise more applied research? I tend to ignore all these dichotomies between applied and basic research, quantitative vs qualitative, theoretical vs basic. I’m very ecumenical. I love all of it. It’s precisely because I love the social sciences and precisely because I believe they are so relevant to the problems today that I’m interested in addressing some of the constraints we’ve been discussing. In the 20th century, human beings saw great promise and derived great benefit from innovations in the natural sciences. From the discovery of plastics and polymers, to the inventions of antibiotics, these discoveries have had tremendous impact on human welfare. But in the 21st century, the social sciences offer equal promise – I would even say more promise – for improving human welfare because so many of our problems arise from human behaviours. A deeper understanding of behaviour and the development of intervention strategies would be very valuable – for example, with new ideas regarding institutional arrangements, nudges of different sorts, or even social network interventions. For example, in some of our own work, we’ve done experiments involving thousands or even millions of people, showing that we can get groups to be more healthy, more cooperative, and more civic-minded, by exploiting an understanding of both face-to-face and online social networks. These diverse sorts of interventions offer promise for improving human welfare. So on the issue of applied vs basic, my answer is both/and. I think that basic research in the social sciences in crucial, but I think equally highly of applied research and the translation of discoveries to improvements to human welfare. Incidentally, at Yale, we have a so-called Roybal Center that aims to do just that, translation, when it comes to advances in network science. You’ve published in some of these emerging crossover fields like biosocial sciences and social neuroscience – what were some of the methodological issues that needed to be overcome and how might researchers look to adapt to facilitate transdisciplinary cooperation across STEM and social sciences? Nicholas A. Christakis, Patrick Dunleavy, Amanda Goodall and Andrew Oswald will be discussing Do We Need to Shake Up the Social Sciences? further on Tuesday, October 21 at the LSE. Click HERE for more information or follow the debate on Twitter at #LSEsocialsciences. I think that what most scientists aspire to is discovery. And I think that discovery is greatly facilitated by methodological innovation. One of the nicest things you can say about a scientist is that he or she makes his own tools. Galileo needed a telescope and made one for himself to look up to the heavens. Van Leeuwenhoek invents the microscope and sees all these new things. Newton invents calculus and he sees all these new things. The advance of methodology offers great promise for discovery, and we’ve had a number of advances in the social sciences – like big data and the massive/passive data we talked about earlier, and computational power, and statistical methods, all of which are very promising. The second thing that is often required for discovery is good observation. You don’t just need a method: you observe something and you acquire data. The more difficult to obtain and the more esoteric the data is, often the better it is. So real discovery often requires seeing something no one has seen before and not just seeing it in a new way. Finally, the third thing is theory: we need to be animated by good ideas! And if you could have the perfect storm of a really good idea and really good data and really clever methods, you know that is… that gives me a feeling like none other I have had in my life. It is just an incredible feeling. It is rare but it is amazing – moving, really. So I think that is what we should aspire to. I recognise that we cannot always do that. But I think that should be our mission. Many social scientists see their role as promoting social change through research. Is re-structuring along new topics aimed at de-politicising (or re-politicising) research? How might the social scientists better understand their moral role? There’s a kind of optimism in being a scientist that I think is coupled with a progressive vision of humanity. I think politics can intrude on all the sciences. Let’s not forget the whole helio-centric vs geo-centric debate that Galileo had with his opponents – and that was not a social science. It was a big political/religious issue whether the Earth was at the center of the universe. Ditto with Darwinism, or the use of embryonic cells in stem cell biology. There are political debates that affect the natural and not just the social sciences. But I do think that most scientists are optimistic. They have a progressive vision of the world. They believe that the world is knowable and improveable through their efforts and the efforts of others. And I find that to be an appealing thought. My wife, Erika Christakis, once told me that she thought it must be so good to have a job where I get to participate in a conversation that stretches back centuries and will continue for centuries, to play a part in such an activity, and I think she is so right. It’s a privilege. I don’t think the problem of morality is specific to the social sciences. Look at the consequences of the discovery of nuclear physics. You get bombs. Or consider the poignant example of what seemed to be an esoteric exploration of plant biology and plant hormones and the branching of trees. These discoveries were then used in part to develop defoliating agents used in warfare. Here’s the work of a plant biologist being applied in the invention of Agent Orange. So I don’t think that the potential misapplication or the misuse of scientific discovery is limited to the social sciences. And I think, incidentally, we might as well get that monkey off our back. I’m not trying to be naive and suggest “Who cares?” What I’m saying is that I don’t think we need to – uniquely among the sciences – own that problem. Finally, I think it is possible for us to achieve objectivity about social phenomenon, just as we can in phenomena in the biological and physical world. Is there a risk that by identifying certain areas as no longer relevant that policymakers will deem social sciences as a whole not worth funding? Yeah, but that would be their own foolishness. That is not at all what I’m arguing. But I don’t think we do ourselves any favors when we go back to funders and ask them to fund work about which they might rightly say, “Well, we know that already.” Of course we need some people working in those areas, and we need to train the next generation, but imagine if you were a researcher in biology and you went to a funder and you said you wanted to explore the gross anatomy of the pancreas. People will say,”but we know that already, why should we fund that?” And they might ask, can you instead tell us something about the stem cell biology of insulin-producing cells? I think the social sciences have to keep moving. We have to identify where the frontier is and put manpower where that frontier is. And we have to identify the ways in which discoveries there can be translated. It’s a tall order, but I am certain that we are capable of it. This entry was posted in Higher Education Reform, Interdisciplinarity, International Debate and tagged LSE, Nicholas A. Christakis. Bookmark the permalink. Post a comment or leave a trackback: Trackback URL.